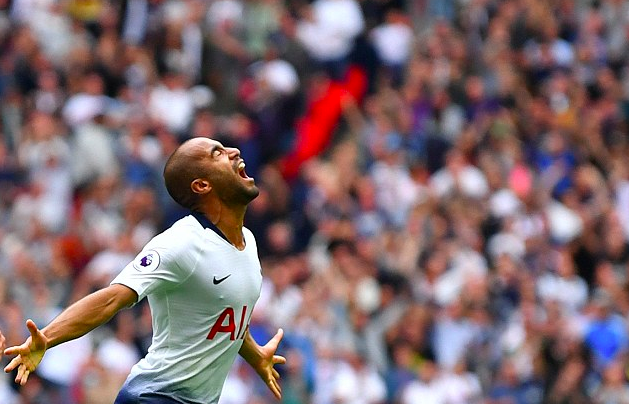 With 3 goals in 3 starts, it is inevitable that Lucas Moura has had a good start to his second season at Spurs, topping it off with a second-half brace at Old Trafford on Monday night to secure our first win there since 2014. With Sonny away another week, Lucas has another game to prove himself to become a regular in our starting line-up this season. He has been our most influential player in these first 3 matches and I have a hard time seeing how you could put a player like that on the bench. I was disappointed not seeing more of Lucas last spring, I thought he looked good in the FA cup matches and lively once he came on in the Premiership. Although, I understand that it would be hard to bench any of our 4 attacking players given that they all had fantastic seasons. However, this season Lucas has so far not shown any signs of having to adapt to the fast-paced Premier League, it looks like he has been playing with us for 2-3 seasons. His link-up play with Harry Kane, Dele and Eriksen looks interesting and imaginative, and his work rate is incredible. On top that, he even wins headers. Looking back to Lucas’ years in Paris, his goal count increased every season netting a total of 17 goals and producing 7 assists in all competitions 2016/17. Sure, you can argue that the competition in France is not as good as it is in England; however, Lucas is a winner and he won the league 4 times in a row with PSG (2012/13, 2013/14, 2014/15, 2015/16). I think we are all tired of hearing that Tottenham has to win something to prove themselves as a big club. Nevertheless, it does not matter if we play good/exiting football if it does not result in a trophy at the end of the day. With Hugo winning the World Cup and Sonny hopefully bringing the 2018 Asian Games home to South Korea on Saturday we finally have some players with experience of winning a trophy. Looking forward into this season I, as every other Spurs fan out there, am eager to see what Lucas has in store for us. By getting Lucas on the ball in and around the oppositions penalty area, I believe we will be awarded more penalties than we have been previous years (should have had one against Man U on Monday). Every time he goes one on one with a defender you cannot help but fancy him to beat the defender or get fouled. Imagine having another player with a high goal and assist tally this season apart from Harry, Dele, Eriksen and Sonny. I think all managers around the world were scared to play us last season. This season, having kept all our key players and with the addition of Lucas Moura (and Toby Alderweireld) we are even scarier to play against. Let us keep our fingers crossed that our players will stay healthy.